There is plenty going on at the moment! First Devon & Cornwall have announced more fare deals.This time though they are not aimed directly at Plymouth Citybus! Great news for people wanting to get to Derriford Hospital. Our service 15 runs 6 days a week between Plymouth City Centre, Mutley Plain, Crownhill, Derriford Hospital, University College Marjon, The George Hotel, Roborough and Woolwell. From Monday to Friday it runs up to every 20 minutes and on Saturdays up to every 30 mins. 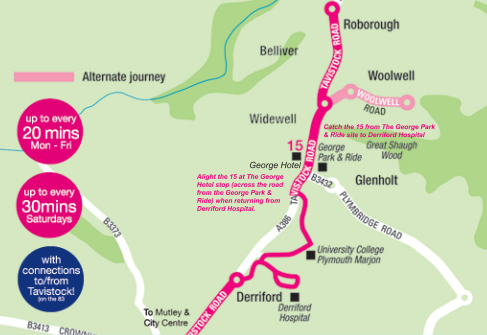 The journey time between The George and Derriford Hospitals main entrance is only 8 minutes. Plus to make travelling to and from the Hospital even better we've launched a super value return ticket. With parking limited and quite expensive at the Hospital this makes getting to and from the Hospital so much easier and cheaper! (Plus some of the parking is quite far from the hospital entrance and with the 15 you can get on and off right outside the main entrance - to get back to The George it leaves from stand 3). And dont forget parking at The George Junction is free! Although this is welcome I am a bit surprised as it seems to be aimed fairly and squarely at Target Travel who already operate the Derriford Hospital Park & Ride PR3 service. Their service is more frequent and I am not sure of the fare but I think its more than the £1 return that First are offering. I have not seen any publicity for this offer at the hospital yet but I can see it being quite popular. I cant imagine Target will be too happy though, or the council who support the service. Looks like first are trying to glean every penny they can before closing up shop at the end of the financial year! Desperate comes to mind. I've heard there's plan's to build a road through the first depot anyway, can't see first coughing up for a new depot somehow. what utter rubbish you talk.. i can tell.you first will still be here in 5 years time they are building a new network fir the future now. A road? To go where exactly? The depot is in a quarry! I can't see that this is "trying to glean every penny before closing up shop", why otherwise would they, for example, be painting vehicles? OK, repainted buses can easily be moved around with a swap of lettering, but my local First depot has just a handful of repainted vehicles in a fleet of 150 and no one suggests that is closing. Secondly, if there are plans to build a road through the depot then the highway authority will have to provide an alternative depot. Finally, why shouldn't First compete against the small guy as well as the big? Indeed some time back when the First subsidiary I worked for faced competition the retaliation plan deliberately included not only the routes with competion but also several that didn't. Partly this was to provide a 'control group' for the fares experiment, but also to stop people on non-competitive routes petitioning the competitor to run to their locality and create lower fares there - only to deregister after a short time. First certainly haven't covered themselves in glory, much of what they have done over the years is questionable, and the branding on the purple 6 proves they aren't out of the woods yet, but there is a lot more to this business than people see out on the streets. They seem to have missed a trick here as the return journey does not go into the P&R but makes passengers get off on the other side of the road. Apart from the minute or so extra time, I don't see why it can't go in - the right turn to get back on the main road is not prohibited. No need to go into the P&R site outbound, why compete with your own service PR1 ?? The trip to Woolwell or Roborough is more lucrative and does not need the extra inconvenience. If you are trying to get passengers from Derriford to the Park & Ride then yes - you really do need to go into the P&R site. Its not competing with their own PR1 at all (at least the Derriford - George section isnt - and thats the bit with the special fares). At the moment Target PR3 is just as busy as normal and the drivers have not seen any impact from the new promotion - they are letting their passengers know that they go into the The George PR site. Target generally use the same drivers on their service who have a good relationship with their regulars. The decent buses really help too. Personally I thin First would be better off with special fares on the Derriford - City Centre section of the 15 as that sees a lot of competition with Citybus 42s. I don't think First are necessarily trying to target Target as it were, I think they are just trying to build up their customer base across the city. The 15 as it did when it went to Mainstone picks up the vast majority of customers between City and Derriford. This £1 fare is an ideal way to ensure the buses are packed on the other half of the route..making it a nice profitable route. The purple 6 seems to be picking up well after a few days, saw it a couple of times today being chased by Citybus 8/9 and First had at least the same amount of customers if not more.. they could seriously hurt Citybus here.. I have travelled on 3a several times this week and this service seems to be picking up as well, outside the rush hours where obviously people are tied to key cards etc, the 3a seems quite busy and many people chose it over the 61 when I was at Royal Parade. Maybe things looking up for First, hopefully more extensions and offers to come? £1 fares won't make a route profitable, it's the economics of the madhouse. As per above... The fares do not need to stay at £1 forerver.. they can build business up and increase fares to £1.50 single or £2.50 return, still lots cheaper than Citybus so customers should stay. Also if they get 300 customers a day they have taken over £600 off Citybus so it's a double whammy. This could be a massive problem for Target as i think the council can not continue to subsidise a route which is being operated commercially by another company, as per the First 76 and Western Greyhound 576 to Callington recently. Both the daytime 76 and the 576 are commercial services - on Sundays the 76 is subsidised by Cornwall Council and serves St. Dominick while the Sunday 576 is still commercial. I don't think there is any complicated game going on, First are just looking for areas where they can offer a cheap service. If I were First I would axe 76 and leave the route to Western Greyhound.. use the resources for Southway route in the new year perhaps, as they have done with X80 to Stagecoach. Much better returns on shorter Plymouth routes. I too have seen empty First buses on the 76 and decent loads on the 576. From Callington, the 576 is quite a bit quicker as it does not go through St. Dominick and also avoids Fore Street (and the industrial estate) in Saltash. First took the evening and Sunday contract from WG, which suggests they may have tendered unrealistically low - especially considering the profit margin Aberdeen demands. Shame on First taking out their frustrations on Target Travel and the city taxpayer as the PR3 is part funded by us!!! Anon 22.32, perhaps it is you talking rubbish? First have had a shambolic history not only here in Plymouth, but throughout huge swathes of the country (Grampian, Northampton and even London they couldn't make a profit out of) they operate down at the heal buses, poor reliability as in Bristol where they have been sent before the traffic commissioner several times. When you compare First with the likes of Stagecoach, Arriva and even smaller groups they look at best amateur. Coming back to Plymouth they (First) are operating B6's which have poor climb ability on hills, ex Hong Kong Darts, ex London Darts and Tridents which we wont get anymore after the sell off of its London operations, their drivers are disillusioned and when did First last invest in new buses for routes that dont include the P&R. I do feel Plymouth needs at least 2 bus operators to maintain sensible fare levels but if First dont succeed this time I feel our city will be another Northampton. the new road is true i used to work for first and its common knowledge amongst the staff, they are building new housing estates there, they have already started taking the back quarry wall down! page 14 on this link shows a map where the planned road goes right through the depot. Very interesting. From a quick scan through it doesn't appear that any enforced relocation would happen as part of the initial development but no doubt all the associated uncertainty and disruption does give another reason for people walking away from buying the Plymouth operations.